I remember my father making cracklin’s when I was young. It was then that I learned the secret to good cracklin’s – slow cookin’. Cracklin’s is a tasty by-product of rendering fat. With a sprinkle of salt these golden morsels are a delightful treat. Rendered fat was the primary cooking oil used until modern technology made vegetable oils available. Rendering fat is a basic technique of animal processing. The rendering process removes the loose connective tissue from the fat cells. The result is liquid fat, which is solid at room temperature, and an edible byproduct called cracklings or greaves. Greaves is defined as the unmeltable residue left after animal fat has been rendered. 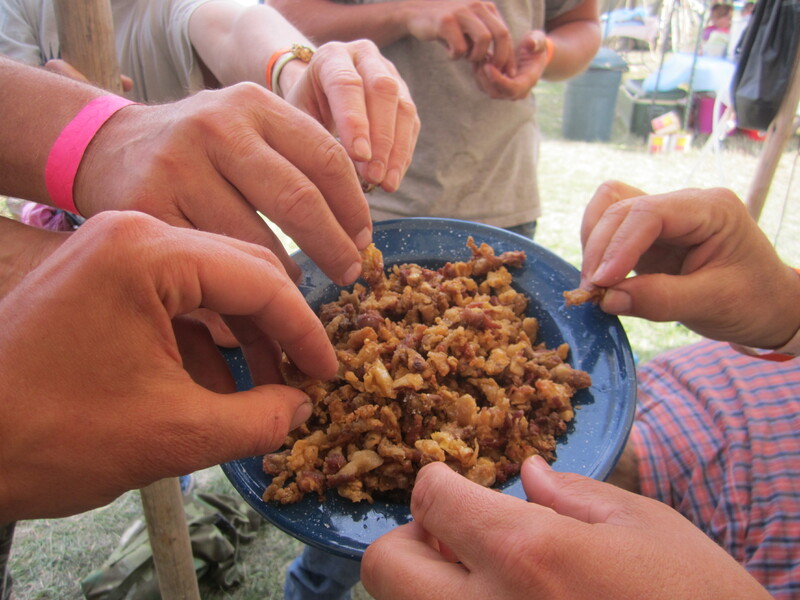 This simple dish is an addictive snack that we have in every Traditional Animal Processing Workshop. Cracklin’s – a tasty treat that is worth the wait. Visceral Fat is the fat around the internal organs. As a whole, this fat is considered premium, though some fats such as the fat surrounding the kidneys is considered the absolute best. This fat is often used in soaps. Render the visceral fat separately from the other fats. Intermuscular fat is the fat within the muscle structures. This fat produces the lowest quality rendered fat. Though the byproduct of this rendered fat is quite tasty since it may include pieces of meat. Rendering the Fat – Rendering fat takes time but almost no effort. To render fat, cut the fat into one-half inch cubes or smaller. The fat may even be run through a meat grinder. Place the cut or ground fat into a Dutch oven. Cook over low to medium heat, stirring regularly. 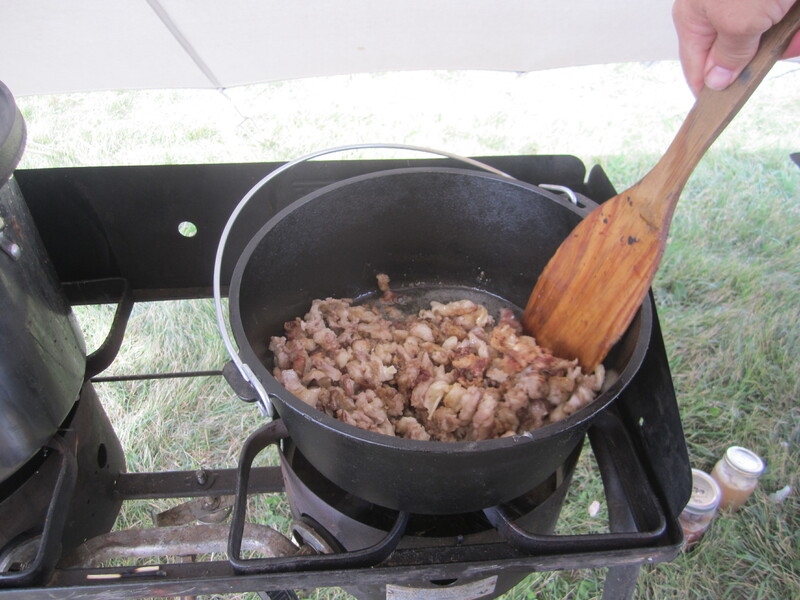 Cook slowly until there is nothing left but clear fat in which the pieces of light brown fat (greaves) are floating. The best rendering takes hours at low heat, which prevents the rendered fat from burning. It is important to not let the fat smoke. (Fat brought to the smoking point will taste burnt and will not be as healthy.) This will take from one to three hours, depending on the amount of fat. Rendering can be done more quickly as when cooking bacon, however caution must be observed to stop the process before the oil starts to burn. Remove the cracklings or greaves from the rendered fat by scooping them out with a slotted spoon or straining them out with a piece of cheesecloth. Lightly salt the cracklings and serve serve them hot. Any left over cracklings are a flavorful addition to stews. Note: The best rendered fat is cooked extremely slow. To help understand how slow, this process can be done in a slow cooker over several days if time is available. Cleaning the rendered fat removes most of the small particles of greaves that could not be scooped from the rendered fat. 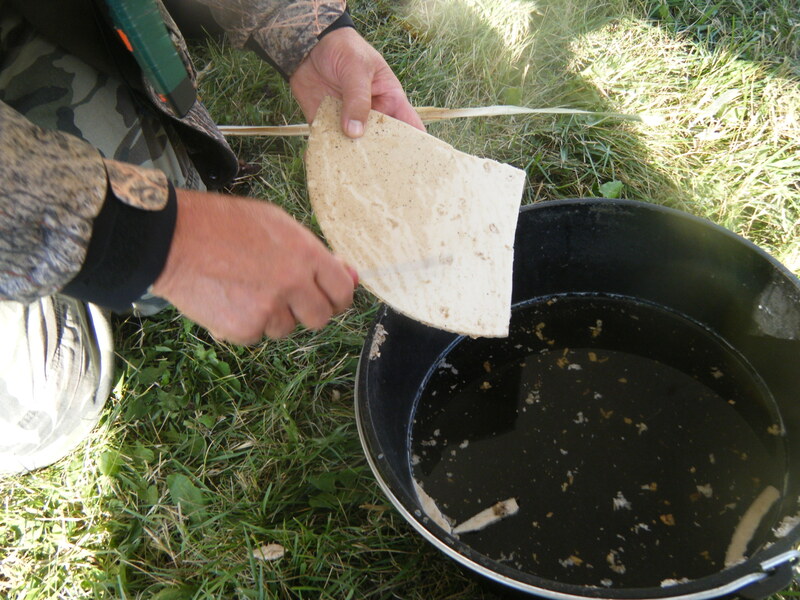 Cleaning the fat makes it more usable for things like fat lamps, pemmican, soap, etc. It also keeps it from going rancid too quickly. Place a few inches of water into a Dutch oven. Pour the rendered fat into the Dutch oven. Bring the fat and water to a low boil. Allow the fat and water to boil for a few minutes and then remove it from the heat. Let the mixture cool until a brick of white fat is formed (usually overnight) remove the brick of fat from the vessel and scrape the residue chunks off the bottom of the fat brick. Repeat the process with fresh water. Generally two cleanings is sufficient, however if time permits, a third cleaning will yield superior quality fat. Note: Unless the fat was burnt, the water and the residue from the cleaning may be added to the stock for additional flavor. Caution: It is very dangerous to pour water into hot oil. This will result in a fire ball. It is important to let the rendered fat cool down to lower than the boiling point of water before adding any water. Pouring the fat into the water is a safer procedure. More recipes from the Traditional Animal Processing Workshop. Learn more about the Traditional Animal Processing Workshops. Locate an Upcoming Workshop to attend.